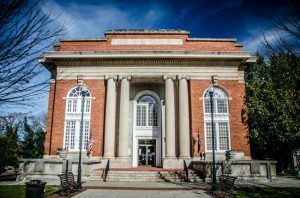 This Beaux Arts courthouse in downtown Sumter was built in 1907 and is one of nine South Carolina courthouses designed by noted 20th century architect William Augustus Edwards. The building is a classic “I-plan” courthouse, which means it is set back from the street and runs the entirety of a block. This style was popular for courthouses during the early twentieth century, as architects believed it projected grandeur. 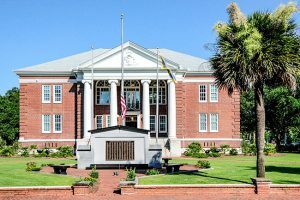 The original Sumter County courthouse was built in 1821 by William Jay and was remodeled in 1839 in the style of Robert Mills, a nationally-renowned architect from South Carolina who designed many of the state’s prominent public buildings. A postcard of the Mills-inspired building is pictured below. The courthouse was enlarged in 1896, but by the turn of the century plans were in place to build an entirely new building on the current lot. 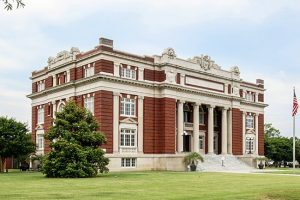 Darlington native William Augustus Edwards, known for designing public buildings throughout the Southeast, was hired as the project’s architect. 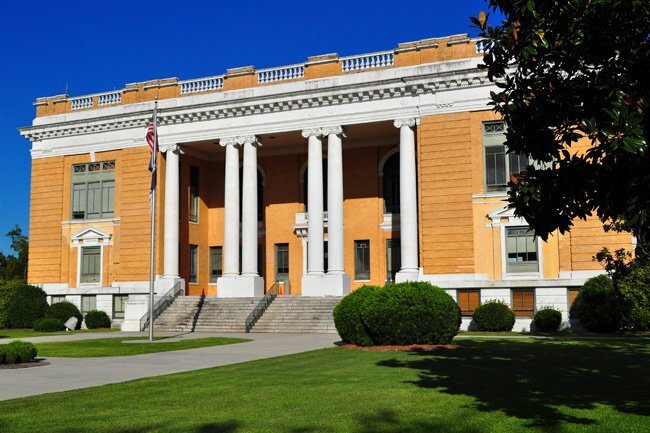 More than a century later, Edwards’ courthouse still serves the people of Sumter County. 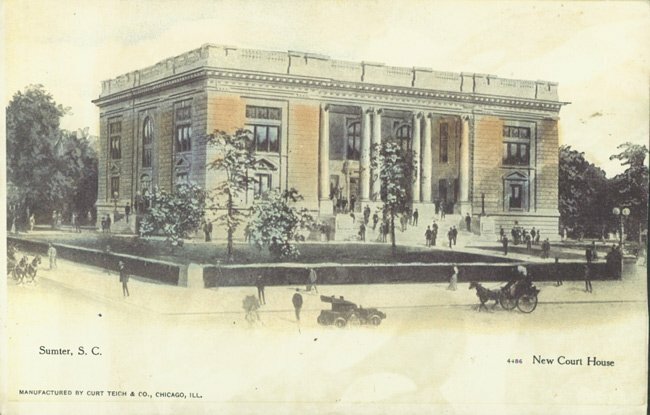 The photo of the postcard below depicts the present courthouse shortly after it was built. 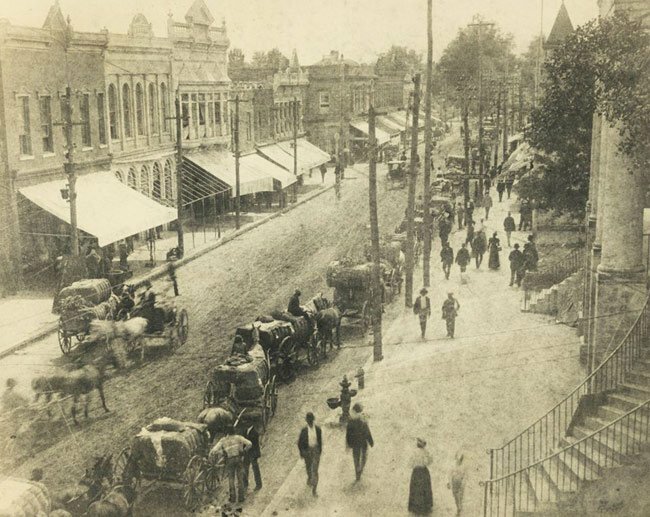 The below photo depicts Main Street from the steps of the original courthouse. 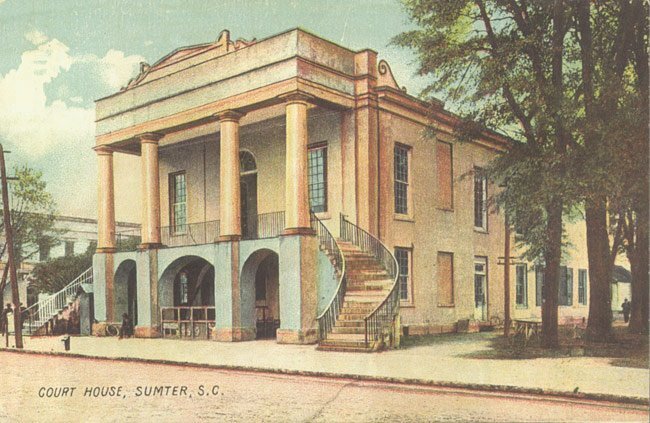 The Sumter County Courthouse was one of nine courthouses designed William Augustus Edwards, a prominent South Carolina architect of the early twentieth century. 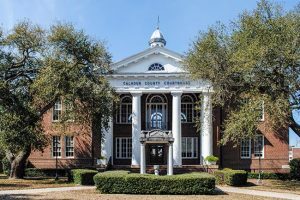 In 1905 seeking to replace the original 1821 courthouse Sumter County contracted with Edwards to design the new building. 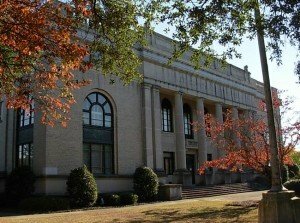 The building that Edwards designed for Sumter County was an I-plan courthouse, set in the center of a deep open block that ran all the way from Main to Harvin Street. The I-plan was a popular design for courthouses all over country at the end of the nineteenth century and the beginning of the twentieth century. 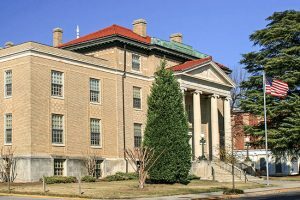 Edwards displayed a strong Beaux-Arts sensibility, however, by setting his courthouse with its long axis parallel to Main Street and putting the recessed entrance portico in the center of the long side. This creates the impression from Main Street that the building is really more of a rectangle with a notch carved out for the entrance. This impression has been much reinforced by the actual filling in of the rear notch in the early 1960s during a remodeling and enlargement of the building, so that it now actually has rectangular footprint. Flanking the Sumter County Courthouse is a thoroughfare known as Law Range. 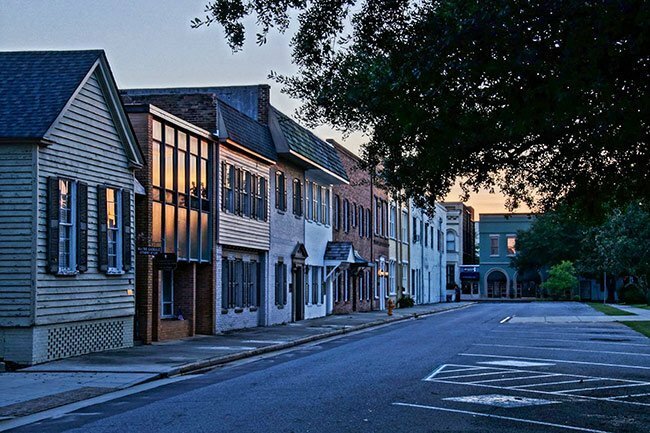 Law Range is made up of a row of office buildings that have historically housed many of Sumter’s law firms.